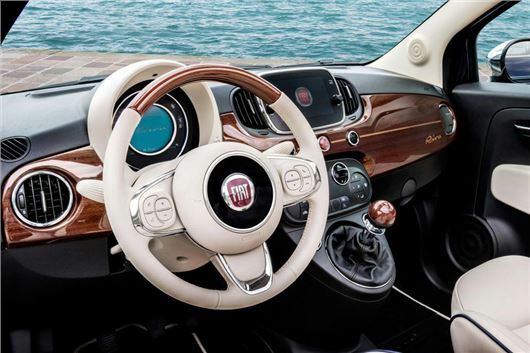 I seem to have reached an impasse with FIAT that just refuses to acknowledge that, up to now, there is still no mention on any brochure / price list of a Wood Steering Wheel Option on the FIAT 500 Riva, despite every brochure, U Tube video of the 500 Riva showing a wood and leather steering wheel, but for some reason it is not part of the standard Riva package. Allegedly it has been a £750 option since 29th of September, but is nowhere to be found online. I ordered a new FIAT 500 Riva at the end of August, assuming a wood rimmed wheel was supplied with the car, but it is not to be. I really could do with your help. I agree, it is an essential part of the mahogany and white leather ‘Riva’ trim of the 500C Riva. I would guess that the wooden part of the steering wheel might have been deemed illegal for safety reasons, but no one is prepared to admit it. Odd anyway, because Mercedes fits wood and leather steering wheels. The fact that the show cars all had it and the brochure shots all include it would not have stopped someone later deeming it as unsafe and, unfortunately, since Johnson v HWM 1997 a manufacturer is not obliged to build a car precisely to brochure spec, nor is a dealer obliged to deliver it because the judge acknowledged that between brochure and production things could change. Recently a gang of kids went on a rampage and stole all the delivery cage trolleys from round the back of my local Tesco. Unfortunately for me they decided to push them down the road and into my car at the bottom of the road. This caused significant damage to my brand new car. The kids have not been caught but I have all the footage of them on my home CCTV. Tesco and the police are aware as several other cars were damaged but it is unlikely that anybody will be prosecuted and the CCTV footage is poor quality. Is Tesco liable for this damage as the trolleys were obviously not secured properly overnight? What would you recommend for me going forward with this? There is a chance that Tesco could be held liable for negligence for not chaining up the trolleys, but it's a long shot. You could try a Small Claim in the County Court. But if you are alleging damage of more than £10,000 that is no longer a 'small claim', would need to go to the full County Court and would cost a lot of money. I am considering exchanging my 2003 Volvo V70 to a 2010 version. There is such a choice such as petrol/diesel, auto/manual and. Can you able to help me home in on the best option. A 2010 will still have the old engine range, which has always been ridiculously complicated, compounded by Volvo's insistence on calling different engines by the same D or T designation. Our carbycar entry gives you the detail, but cannot dispel the complexity: /carbycar/volvo/v70-2007/?section=history/ The new 2.0 litre 4-cylinder Volvo diesel and petrol engines are the best, but they are from 2013. At least our description of the 2010 models, announced in May 2009, is reasonably straightforward. My vehicle is a 2013/63 Peugeot 508 SW with a 1997 cc diesel engine, 140hp, manual transmission, 25,000 miles. I always use BP Ultimate diesel fuel. An rpm-related rattle developed about eighteen months ago, at around 2,000 rpm, which I thought was a loose bit resonating. It was intermittent so I didn’t worry about it. However, I have since traced it to the engine itself. It happens most noticeably in second gear on the odd occasions when the car is accelerating hard; not always, but frequently. It is also noticeable in first gear, but hard acceleration is first gear is quite difficult to reproduce because the speed increases violently. It can be detected in third gear, but only because I know what to expect, and not demonstrably. It sounds rather like pinking would in a petrol engine. Not only is there a rattle from the engine, but as the revs pass through 2,000 there is a noticeable drop in power in second gear. It does not happen under most normal driving conditions. I am not a hard accelerator by nature. Most often, it happens when accelerating in second gear away from a roundabout with heavy traffic flow and therefore needing to establish lane position without undue obstruction to others; or occasionally when joining a fast road from a side road without a long feeder lane. I have used the local dealer for around 7 years (two cars; a 407 SW before). They offered a free half an hour on the road with one of their senior mechanics. He was very helpful, and heard the rattle, but the loss of power was difficult to reproduce on the test drive. He observed that 2,000 rpm is max torque engine speed, so “if it is going to happen that is the likely rpm” (yes, I had worked that out! ); but he didn’t suggest any further examination or remedy. He did say he would check around professional literature and blogs for other instances and get back to me if he thought there was a problem. At my next service I asked about this: “note on file says not a problem”. I am not happy with the situation. The rattle is, if anything, getting more noticeable, starting to occur under less stressful conditions, and the brief power drop is still there. The concern is, of course, that there is an underlying problem that may lead to premature engine wear or failure; although I have a good comprehensive warranty, that’s not the point. Is there anything you might suggest I focus on to try to pin it down, so I could go back to the dealer with a positive suggestion? This is what is happening to EA189 VW Tiguan 2.0TDI 140s after the first stage emission defeat software remap. They can rattle and lose torque between 1,400 and 2,000rpm. I have 14 cases on record. With the Tiguans I suspected a fuelling problem (reduced fuelling to reduce NOx emissions). So I wonder if in your case you're not getting sufficient fuel pressure either because the fuel tank lifter pump is a bit weak or because of an intermittently blocked fuel filter or because of a worn high-pressure fuel pump. I can't imagine that the fuelling software has changed all by itself. The dealer eventually agreed to take the car back subject to a charge of 30p a mile for MS’s 6,000 miles. For a £7,500 car, I thought a charge of 20p a mile would be fairer. I wonder if you have an opinion on purchasing a car by either using PCP or using cash to make up the difference when part exchanging. I am thinking of changing next year and have a 2015/55 Skoda Octavia Estate 4x4 that will have about 12,000 miles on it by next summer. Is it therefore better to sell the car for cash and use the money to pay the monthly charges or take the part exchange price and use available money to make up the difference? Would being 74 make any difference one-way or the other? Part-exchanging a two-year old car with 12,000 miles is a very effective way of losing a huge wad of cash, in your case likely to be £12,000 or more. So if you don't absolutely have to get out of this car I would keep it until it has amortised more effectively. By that I mean even though it will have lost more money over the years it will have lost considerably less money per year. I am interested in a Mazda MX-5 2.0 litre, which is for sale locally by a private seller. It is 2006/56 with 60,000 miles on the clock by two owners. The seller is asking £4,900. My current car is a Mk 7 VW Golf that I love - it's my fifth VW - and I intend to keep it. I am a retired female, aged 67, looking for a fun car whilst I am still fit enough to enjoy it. Would the 2.0 litre MX-5 fit my brief? Any advice you could offer would be much appreciated. That should be an early third generation MX5. Great handling, and a world of difference in power between the 1.8 and 2.0 6-speed MX-5. Like many drivers I use premium grade petrol in my Morgan Roadster 3.7 V6 to take advantage of the supposed benefits including engine protection. On a recent trip with other Morgan owners I had filled the tank in the morning near home as usual with Shell V-Power petrol at a price of £1.259 per litre, compared to the price of £1.18 for their standard unleaded petrol. Later the same day several of us stopped at a BP Garage near Yeovil where the price for their standard petrol was shown as £1.18 per litre but on filling up with their Premium Ultimate Unleaded we were shocked to find that the BP price for this was £1.579 per litre. There was little we could do and the attendant was not interested so I would question how this excessive price charged by BP can be justified and warn other unsuspecting drivers to avoid this companies product. Unless you filled up with BP's rare 101Ron Super Super your experience simply reflects a local filling station (most of which are franchises) exploiting its customers. Write to BP and complain. 'Premium Grade' is the oil company name for ordinary 95 Ron petrol. You can't get anything less in the UK. 'Super' is the name for 97-99Ron petrol that usually comes with a bundle of engine cleaning additives. As well as keeping your fuel system clean, the benefit is improved torque at low rpm and if you use that to short shift up sooner you will see a small benefit in fuel economy. That may or may not match the increased cost, but if you bear in mind the cost of fixing fuel system faults, the extra cost of 'Super' is normally still worth it. Driving my 2008 BMW 2.0 Z4 recently following a roadworks diversion I was sent down a rather bumpy minor lane. Over one bump I saw too late to avoid, the front fairing scraped the road surface, causing no damage, but at the same time three warning lights came on: the ABS, the brake system and the Dynamic Stability Control lights. I took the car to my friendly independent BMW garage who told me the brake unit needed replacing at a cost of £1,600 for a new unit or £400 for a reconditioned one plus labour. He managed to clear the fault lights with a diagnostic check but they all came on again the next day. Is there anything else I could do rather than incur this expense? He assures me the car is safe to drive but that I will not have the ABS system protection. If the ABS is not functioning and the warning light is on the car will fail its next MoT. So while the car may be "safe to drive" in the eyes of your mechanic, it isn't in the eyes of the law or your insurer. I suspect a dislodged reluctor ring sensor from the sudden jolt. Take it to another independent BMW specialist. My 1999 VW Passat was hit and run by a council bin lorry. They admitted liability and said they would only pay out the market value for the car. This means I have to find between £600-£800 to put the car back onto the road. I would like to know whether to go to the Small Claims Court as I am the original owner and it has only 67,000 miles on the clock. Unfortunately there isn't anything much you can successfully do in a case like this because the County Courts have ruled that paying you 'market value' for the car "puts you in the position you were in before the damage was done." You could argue that the insurer's offer is lower than 'market value' but then you would need to prove it. Or you could settle on keeping the ‘written off’ car, taking whatever they are prepared to offer, and having the car fixed yourself. We own a 2009/59 Volkswagen Tiguan 2.0TSI that has been taken into a Worthing VW dealer for service, etc. since we bought it from a Kent VW dealer in late 2009 who did the first service. We took the car into the Worthing dealer on Monday the 22nd August 2016 in order for them to check into a problem which we knew we had been having for the past couple of years. In April 2014 we first reported to them that we felt the engine was slightly juddering/misfiring when started from an idle position in the morning, which became less apparent when the engine warmed up but did not disappear entirely. The dealer reported that nothing showed up on the diagnostic computer that there was nothing wrong with it and there was no misfiring in their view. We then took the car back a month or so later having felt it was still misfiring and once again the garage checked it and we were told there was no problem. A week later on Monday the 29th August we were told that they would have to keep the car in to make further investigations. On the Tuesday they said they would need to keep it even longer and the charge for repair would be around £800 and on the Wednesday we were told that they had finally got to the root of the problem but that they had had to virtually take the engine to pieces, that spare parts were having to be ordered from Germany which could take 5 – 10 days to arrive, and that we were not likely to get the car back for two weeks or more and it would cost £4,200 approximately to repair. They offered small discounts on the parts and labour bringing the total to around £3,800 the final bill eventually came to £3,755.46 after they said they had found further savings. There were apologies and we were offered a Jetta loan car, which we used. Our complaint is that had the dealer serviced the car properly and a thorough in depth investigation had taken place two years earlier when we first reported the misfiring then the supposed damage would not have taken place or been as great and we would not have been facing such a horrendous repair bill. We feel that we have paid for their incompetence and we feel let down.